One of the most asked questions I get as I present at workshops is, "How do you fit it all in?" Most of my presentations or workshops focus on interactive read alouds and shared reading, things that are often "left out" of a daily schedule. While I'm presenting I'm usually reiterating the importance of making room for these in your schedule on a daily basis and participants always want to know how I fit it all in. Well today, folks, I'm here to show you how it can be done and how not to "leave out" those vital components of balanced literacy. This post contains affiliate links to Amazon. By purchasing an item on the Amazon site using these links, I will receive a small commission on your purchase. This helps me continue writing this blog and providing you with teaching tips and ideas. Thank you! I have to say that I'm pretty lucky in the fact that our principal makes our basic schedule. 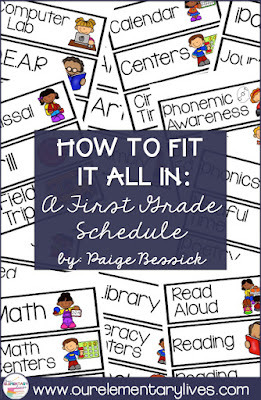 Because of our reading support, Title 1 teachers, specials teachers who rotate between schools and students who switch for math in the upper grades, our principal has taken it upon herself to give us the bare bones schedule that we need to follow. This is quite the feat every year, but it's really nice to not have to worry about creating my own. 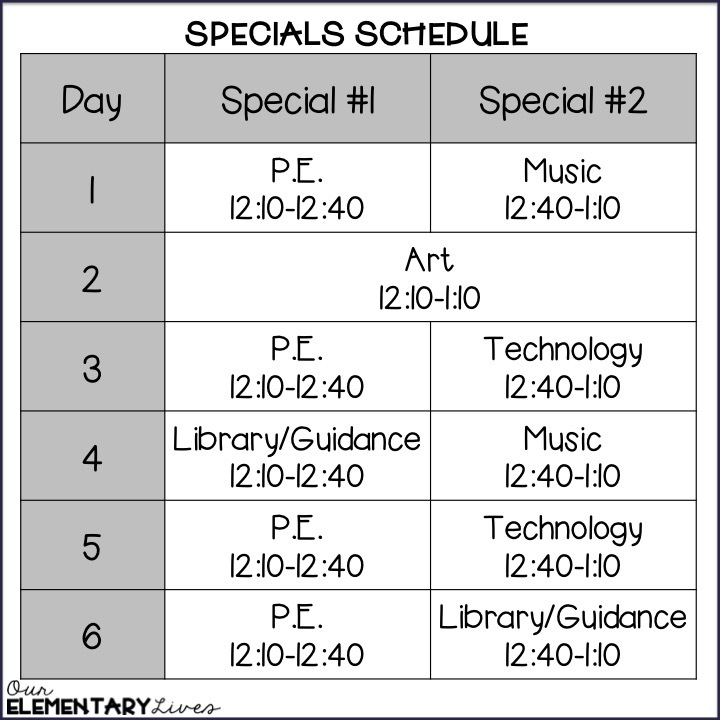 In this schedule, we get 70 minutes for our math block and 100 minutes for our literacy block. It just so happens that lunch splits our literacy block into 2 sections, but it actually works out quite well. 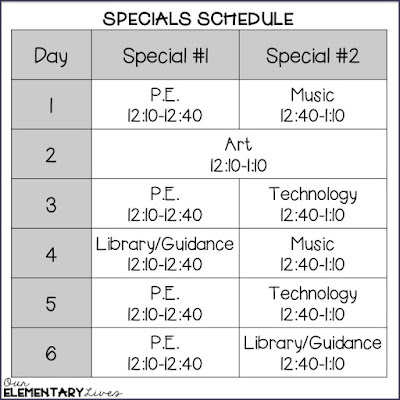 We actually run on a 6-day schedule that allows for us to have an hour of specials/PLC time each day. We are able to have shared team time and meet with our PLC once a week. Now to the big question: How do I fit it all in? Now that you know what our daily schedule looks like, the big question still remains. I will say right from the beginning, that I am no expert at fitting it all in. There are days when something takes longer than expected, or we have to skip something, I'm your typical teacher. 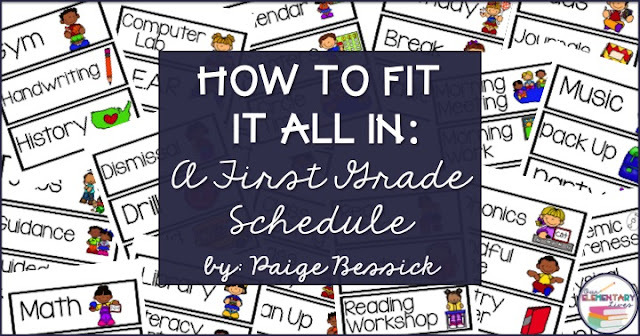 But I'm also that type A teacher who is organized and has a schedule that I follow to a T as much as I can. If it's scheduled in, I'm more likely to do it. Let's start with math, it's a little bit easier to schedule in all of the components. Heres's our daily math schedule. 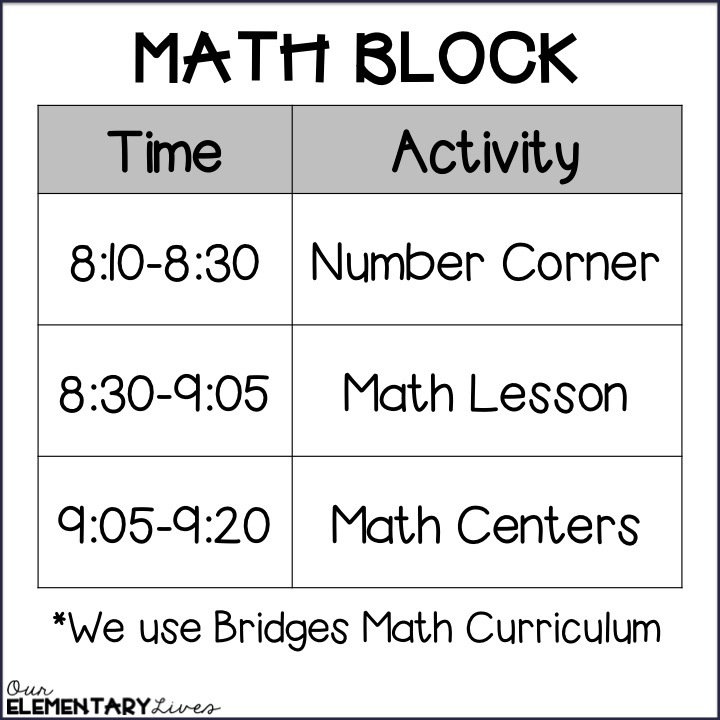 We use the Bridges Math Curriculum. 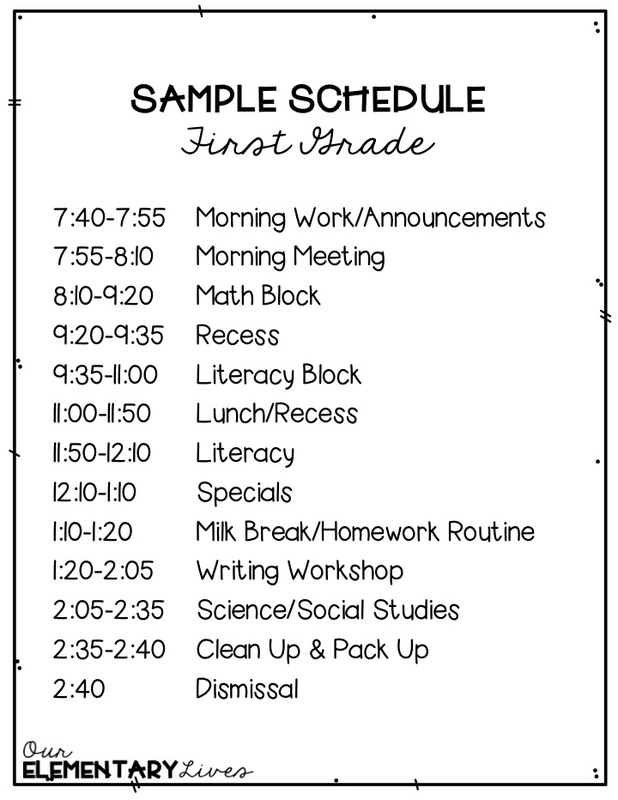 This is our second year using it and I'm still learning how to best implement, but this is our basic daily schedule. Number Corner: Number corner is essentially a calendar routine. 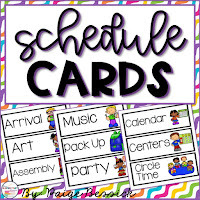 It includes calendar cards, number of the day, a collection routine, computational fluency and number line activities. It's very engaging and the activities go fast so it keeps the students engaged and learning. It is also a great place for students to take the lead and be in charge of several activities. As the teacher's helper, a student can practically run about 75% of the day's activities. Math Lesson: Bridges is the daily lesson. It follows 8 units that teach necessary math standards and practices. It takes about 30 minutes to teach. It includes hands-on activities as well as direct instruction and student journals. 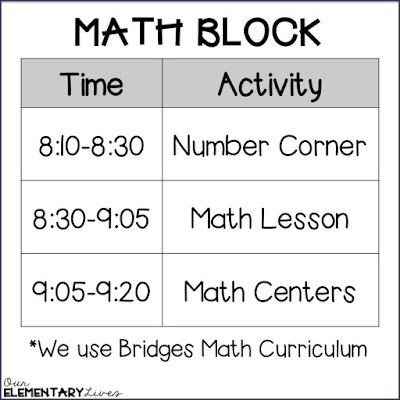 Math Centers: The last component of our math block is Bridges Work Places. These are essentially math centers. The students rotate daily between the centers playing math games. This is when I have a Title 1 teacher in to support and we pull small groups for additional teaching. As we're pulling groups, the rest of the students are at a center playing a math game with their partner or small group. Teaching expectations and how to play the games is key to getting these to run smoothly, but the students love them. 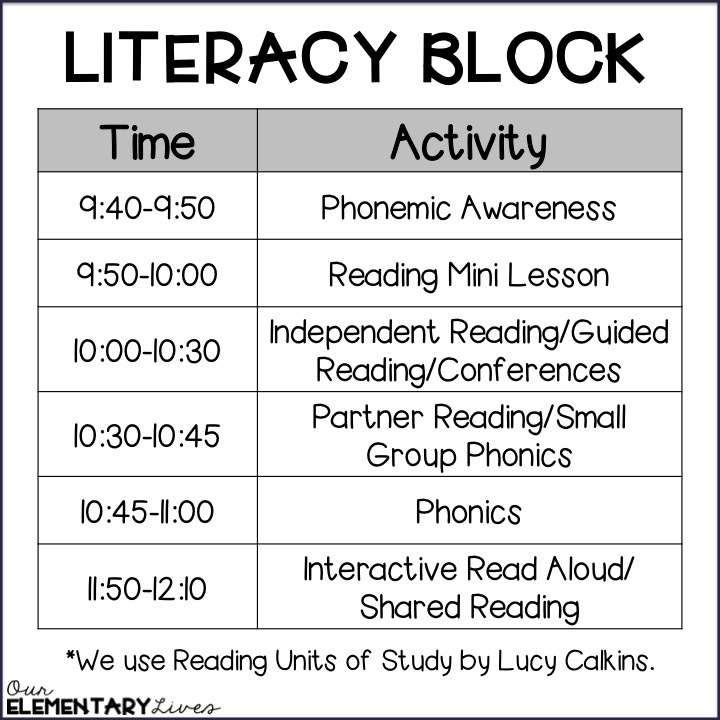 Now let's talk about each component of our literacy block. Phonemic Awareness: In first grade, phonemic awareness is a must! PA is so important because it is the base of learning how to read. Students need to be able to rhyme, blend, segment and manipulate sounds and letters auditorily before moving onto using letters and words. 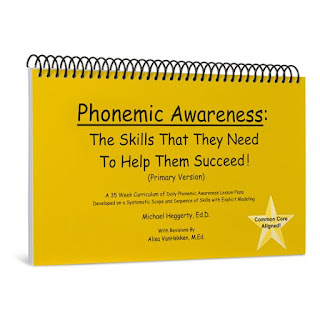 I'm not going to go into more now, but if you're interested in learning more, check out >>THIS<< blog post: What is Phonemic Awareness? 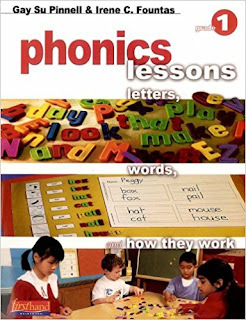 I've been using the Michael Heggerty Phonemic Awareness book for most of my teaching career, probably 10 years. It makes it fun and easy to implement and only takes about 10 minutes a day. Check it out >>HERE<< or by clicking on the image below. Reading Mini Lesson: We use Reading Units of Study by Lucy Calkins. 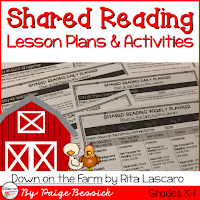 As a reading workshop model, I teach a mini lesson that is no longer than 10 minutes that teaches a specific skill I want my students to learn and work on during their reading that day. My mini lessons contain the 4 main components: connecting, teaching point/teaching, active engagement, and the link. I keep it mini and then send my students off to read. Independent Reading/Guided Reading/Conferences: This is the bulk of my reading block. My students get about 30 minutes to independently read and practice the skill I taught during my mini lesson. With reader's workshop, the whole idea is that students practice reading books at their independent reading level. If you want to get better at something, you have to practice, so this time is vital in my students learning. While they are independently reading, I am meeting with guided reading groups with my students who are just at or below grade level and conferring with individuals or small groups for those students above grade level. I'm very lucky that at this time I have a reading specialist in my classroom to help support my students. Between the 2 of us, we meet with 4 guided reading groups a day. If you've followed me at all this year, you know that my group is extremely low. I wouldn't typically have that many guided reading groups, but that's how many kids I have below grade level this year, so that's what's needed to be done. If I'm not working with a guided reading group, I'm conferring with students based on specific skills they need to work on: fluency, comprehension, retelling, word solving, etc. 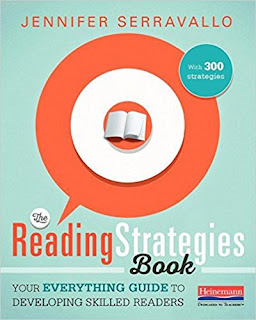 I use >>THIS<< book to help with my small group/individual conferences. Click >>HERE<< or on the book image below. 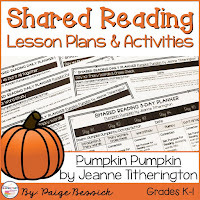 Partner Reading/Small Group Phonics: Moving onto our next activity, depending on the day and what's going on, my students are either partner reading or getting small group phonics instruction. At this time, I still have the reading specialist and our ELL teacher also comes into my room at that time. 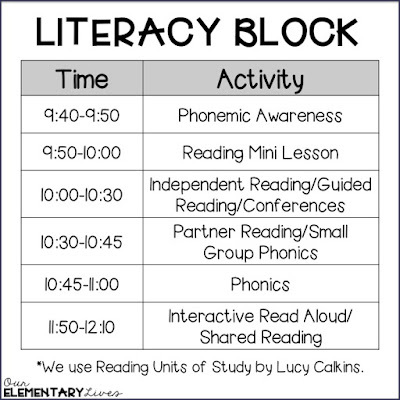 Based on some phonemic awareness and/or phonics assessments, we have decided to meet with small groups to focus on specific PA or phonics skills that are holding my students back (blending, segmenting, letter names/sounds, etc.). While they have my lowest learners, I have the rest of my group. At this time I have done several things. We will often continue partner reading because I know the importance of it. I will sometimes introduce a trickier phonics skill (like long vowels, contractions, inflectional endings) for these students because they are ready for them. I have also done book clubs at this time too. Depending on what I think my students need, I pick and choose between those activities. Word Work: The last thing we do before lunch is word work. At this time, I'm teaching phonics to my entire class. We use Fountas and Pinnell Phonics Lessons for First Grade. At this time, I can differentiate for all of my learners based on the words we use and practice with. For example, if we're doing short a, some students will be getting the basic CVC short a words (cat, hat, van, map, etc.). Other students will be getting trickier short a words that include blends and digraphs (than, math, champ, etc.). Check it out by clicking >>HERE<< or on the book image below. I also supplement with resources that I have created and sell on Teachers pay Teachers. I feel with phonics instruction, it is so important for students to be taught using the gradual release of responsibility, an I do, we do, you do format. Because of this, my phonics resources include activities for just that: whole group, small group, and independent activities. Click >>HERE<< or on the image below to see this Phonics Bundle. 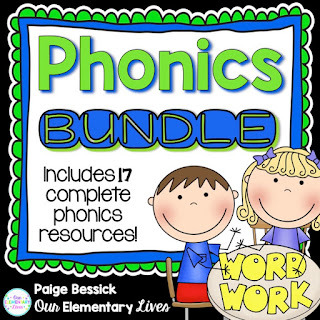 It includes 17 complete phonics resources for all of the short and long vowels, bossy r, contractions, inflectional endings, and compound words-everything you need for a year of phonics instruction. Interactive Read Aloud/Shared Reading: I have this extra literacy time between lunch and specials every day that is 20 minutes (often less when we have snow pants, #amIright?). Anyway, I rotate between interactive read alouds and shared reading. At the beginning of the year, I tend to do more shared reading as most of my class is closer in skill level at this time. Because we are reading/writing for shorter amounts of time and haven't built up our stamina yet at the beginning of the year, I fit in interactive read alouds at a different time. Shared reading is so important for our emergent readers so I make sure to fit this in. 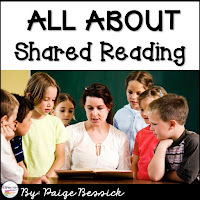 Want to learn more about shared reading? Check out my blog post >>HERE<<! clicking on the pictures below. Later on in the year, I switch to Interactive Read Alouds at that time. 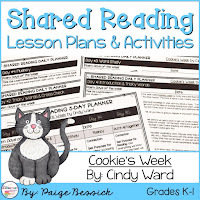 I still do shared reading with my lower level learners during guided reading, I can share more about that later. For interactive read alouds, my students sit next to their literacy partner and we do a read aloud while constantly interacting with the book. 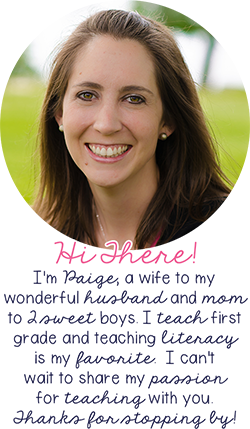 You can learn more about IRAs from >>THIS<< blog post: Everything You Need to Know About Interactive Read Alouds. 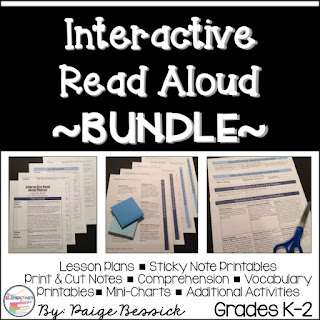 You can check out my Interactive Read Aloud Resources >>HERE<< or my bundle by clicking the image below. The last thing I want to mention is our writing block. We have about 45 minutes for our writing workshop. We use Writing Units of Study by Lucy Calkins. My students absolutely love writing workshop. The first 10 minutes is my mini lesson and the rest of the time is for independent writing time while I do small groups and individual conferencing. At the beginning of the year, when my students are working on their writing stamina, I do some handwriting teaching/practice at the very end of writing time. So there you have it, how I fit it all in. 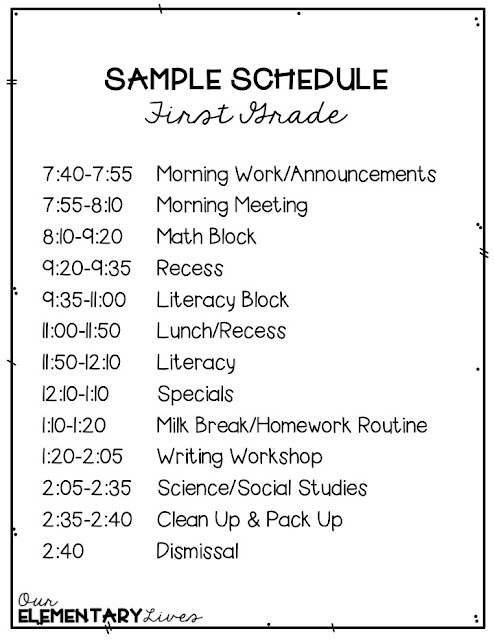 As I said earlier, my schedule is not perfect and I'm no expert, but this works for me and my classroom. These are the components that are important to me so I work hard to fit them in every day. One thing I believe though, is students do better when they know what to expect and what's happening during the day. To help and support all of my learners in my classroom I have a daily schedule. Each day I change it to match what's going to happen. 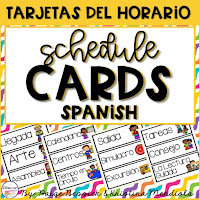 Click on the images below to see these schedule cards in English and Spanish. They are brand new and I'm going to keep them at 1/2 off, that's only $1.50, through the weekend (April 1st). I hope you found this helpful. I know I always like seeing other's schedules to see how they fit it all in. If you have any questions please email me at ourelementarylives@gmail.com or comment below, I'd love to chat. As always, please pin and share for others to see. Until next time, happy scheduling! Great Information. Thanks for the update. When do you "teach" grammar? We have been working to integrate this into our writing time, but it can be difficult.